Every year, tens of thousands of pilgrims from around the globe visit St. Sharbel’s hermitage and tomb. On the monastery’s grounds, a statue of the saint marks the spot where he was first laid to rest. A few months after his burial, mysterious dazzling lights danced around the grave. Now holes blotch the grassy area around the statue; pilgrims have taken bits of the sacred soil, which they believe to have miraculous powers. As did early Christian pilgrims, many still kiss the ground where Sharbel was once buried. 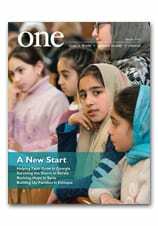 Learn more about St. Sharbel in the story, A Saint Without Borders, from our July 2009 edition of ONE. U.N. peacekeepers have been charged with monitoring Lebanon’s southern border with Israel since 1978. The force was boosted to almost 12,000 troops after Israel and Iranian-backed Hezbollah fought a war in 2006. Read more about the peacekeeping mission on the Washington Post’s web site. Pope Benedict XVI appointed Archbishop Edwin F. O’Brien of Baltimore as pro-grand master of the Equestrian Order (Knights) of the Holy Sepulcher of Jerusalem, based in Rome. The appointment was announced simultaneously in Rome and in Washington, Aug. 29. The order is a fraternal organization dedicated to promoting and defending Christianity in the Holy Land, supporting the Latin Patriarchate of Jerusalem and responding to the needs of Catholics in the region. Its origins date back to the First Crusade, when its leader, Godfrey de Bouillon, liberated Jerusalem. The audio can be found at the bottom of the article. Today, many Muslims around the world are celebrating Eid al-Fitr, marking the end of Ramadan, the Muslim holy month of fasting. Ramadan begins or ends according to the sighting of the moon (though some Muslims follow astronomical calculations). Thus, there can be differences, with one country starting and consequently ending before another. This can even happen in the same area where different groups follow different systems, so one group will still be fasting while the other is already feasting. There’s joy tempered with concern on Tahrir Square in Egypt, which saw a successful revolution topple President Hosni Mubarak this year. And there’s optimism in Libya, where 42 years of rule by Moammar Gadhafi seem to be coming to an end. But emotions are much more muted in Syria, where the government is clamping down to prevent the Arab Spring from spreading, and there is a sense of gloom in Pakistan, wracked by violence and natural disasters. The prisoners let free for the end of the Muslim holy month of Ramadan were mostly protesters arrested in Tahrir Square, and had no prior convictions, English language Egyptian daily Al-Ahram reported. “Life in Purakkad is serene and simple. Read more about the small fishing village, Purakkad, in our May 2009 edition of ONE. To view more of Peter Lemieux’s lovely photos from the village check out the accompanying image gallery. Read more about the rich culture and history of the Eastern Slovakian village of Jakubany in the story Those Who Remain Behind from our January 2009 edition of ONE. Writer Jacqueline Ruyak gives more insight into the dynamics of this village in the multimedia feature accompanying this article. The meaning of the Arab Spring is being discussed at the Rimini Meeting, the annual gathering organized by the lay movement Communion and Liberation. One concern has been the prospect of Islamist radicals gaining influence as autocratic regimes are being overthrown. Indeed, this is not the first time that the subject has been broached, and it has led some to wonder: Is Islam compatible with democracy? John L. Esposito, Ph. D., the founding director of the Prince Alwaleed Bin Talal Center for Muslim-Christian Understanding at Georgetown University, Washington, D.C., tackled this very question in the July 2011 Issue of ONE magazine. Rev. Dr. Elias Mallon, S.A., CNEWA's Education and Interreligious Affairs Officer, also weighed in on the matter in a connected multimedia feature. "There is some difficulty for some Europeans to understand what is going on in the Arab world … because they start from their fears, not reality,” said Wael Farouq, President of Tawasul Cultural Centre in Cairo, and Vice President of the Cairo Meeting. “What is happening now in Egypt is something that should make all of us – east and west, Christian world and Muslim world – feel safe because for the first time in history the power of noble human principles is winning a war against absolute materialist power. What moved the people in Tahir square, and what people had in Tahir square, was nothing but their faith” he told Vatican Radio during the Rimini Meeting. “This power of faith, and this success of this faith, to change reality should make all of us feel safe and feel happy, and look in a very positive way toward the future,” he said. The full radio report can be found beneath the article. A previous speech given by Mr. Farouq to the United Nations in May can be viewed here. Peter Lemieux’s article, Rain Rich, Water Poor from the May 2010 edition of ONE, was also a part of a package that won a 2nd place Catholic Press Association Award for “Best Multiple Picture Package” among other awards. To gain even more insight into the water scarcity issue in Kerala, check out our multimedia feature, Water Woes. "The readers of ONE know well many of the differences that exist within Christianity, with its various churches and communities, each with its own rites and customs. They should not be surprised to learn, if they do not know already, about the diversity that exists within the Islamic world: how the interpretation of the five pillars of Islam – the fundamental obligations incumbent on all Muslims – differs among Muslims." In his article, "Islam's Many Faces," Michael L. Fitzgerald, M.Afr., explores the various sects and traditions which fall under the broad banner of Islam. This and more can be found in the September 2008 issue of ONE magazine. Worshipers pray at Toronto’s Jami Mosque. Opened in 1968, it is the city’s oldest. This year, we have thought to give priority to the theme of the spiritual dimension of the human person. This concerns a reality that Christians and Muslims consider to be of prime importance, faced as we are with the challenges of materialism and secularization. The relationship that every human person has with the transcendent is not a moment in history, but is part of human nature. We do not believe in fate; we are convinced – moreover it is our experience – that God guides us on our path! Christians and Muslims, beyond their differences, recognize the dignity of the human person endowed with both rights and duties. They think that intelligence and freedom are indeed gifts which must impel believers to recognize these values which are shared because they rest on the same human nature. This is why the transmission of such human and moral values to the younger generations constitutes a common concern. It is our duty to help them discover that there is both good and evil, that conscience is a sanctuary to be respected, and that cultivating the spiritual dimension makes us more responsible, more supportive, more available for the common good. Read the rest of the release at news.va.